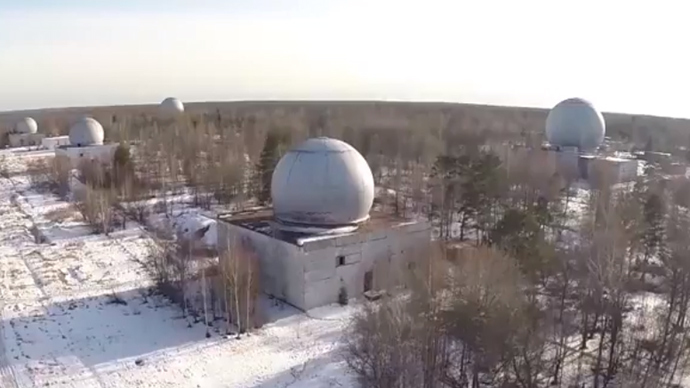 Abandoned and still futuristic, with a touch of a Mars colony in its looks – this is how a deactivated radar component that used to be a part of Moscow’s anti-missile shield appeared on drone footage, shot exclusively by RT’s Ruptly video agency. The A-135 anti-ballistic missile system was deployed around Moscow in 1995 to counter enemy missiles targeting the cities and its surrounding areas. It primarily consists of two layers of interceptor missile launch sites and the Don-2N battle management radar system. The system is operated by the 9th Division of Anti-Missile Defense, part of the Air Defense and Missile Defense Command of the Russian Aerospace Defense Forces. Some A-135 components are being deactivated due to plans of replacing it with a more advanced system, which will reportedly be called Samolet-M, or A-235.